A collection of photographs showing how I would print my etchings. Also some of the materials and equipment used when making original prints. 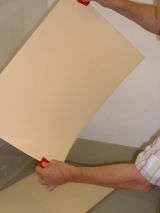 Because of this individual method of hand printing, each image is slightly different from the previous image. Making each one unique and original. Example showing, 'The Pensive Selima Reclined', photographed at Birmingham Printmakers.